Many families worry that their college savings accounts will kill their chances for financial aid. It’s been my experience that it’s usually dads who get stressed out about how colleges will treat their college accounts for financial aid purposes. Some fathers whom I’ve talked are down right bitter. They are especially incensed at the possibility that families that didn’t set aside money for college will hog all the aid. If that’s what you’re worried about, here’s my advice: Relax! Families who save for college are rarely ever hurt in student financial aid considerations. In fact, it’s been estimated that roughly 7% of families who fill out financial aid applications are penalized for their savings. The Free Application for Federal Student Aid (FAFSA), which anyone applying for financial aid will complete, doesn’t even inquire about retirement accounts. Private colleges that use the CSS/Financial Aid PROFILE, will inquire about a family’s retirement accounts, but schools that use the PROFILE very rarely penalize parents for these assets. 2. Parents can also shelter plenty of money outside of retirement accounts. It might not seem like it, but colleges don’t want to strip you of all of your available cash. The financial aid formulas will also let you shield a big chunk of your non-retirement money through an asset protection allowance. 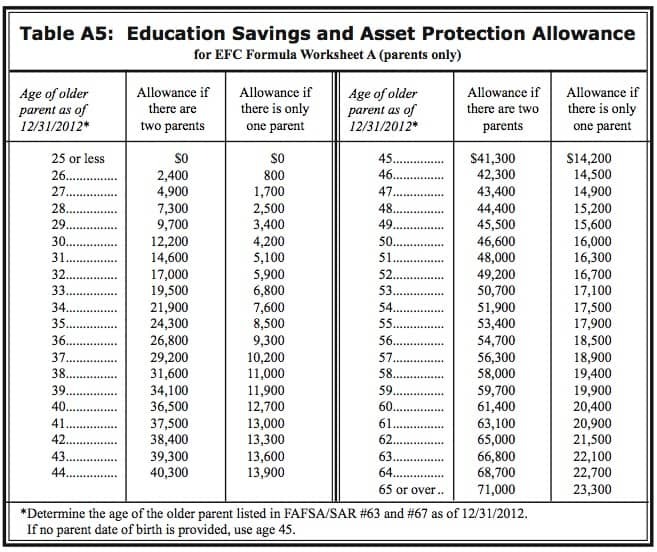 As you can see from the federal chart below, how much you can shield from the FAFSA formula depends on the age of the oldest parent. The closer the parent is to retirement age, the greater the amount he/she can shield from the financial aid formula. Let’s say the oldest parent is 52. The family would be able to shield $49,200 in 529 savings plan money, as well as any other cash laying around in taxable accounts such as savings, checking and brokerage accounts. In a two-parent household, a 60-year-old parent could shelter $61,400 from financial aid calculations. The amount a mom or dad could shelter in a one-parent household is significantly less. A 52-year-old single parent, for instance, could shelter $16,700. Using an example should make it easier to see how this allowance would work. Let’s assume that a family has $100,000 in non-retirement assets, including $25,000 in a 529 savings plan, and the oldest parent is 55. The family would get to shield $53,400 from the FAFSA formula, which would leave $46,600 unprotected. In calculating the family’s financial need, the FAFSA methodology wouldn’t expect the parents to sink all of that money into college. Consequently, the $46,600 in assets would be assessed at a parental rate of 5.46%. When you do the math, the child’s eligibility for need-based aid would only drop by $2,628 even though the family had $100,000 in the bank. Knowing this, would you rather be a family who saved nothing for college or the family who has $100,000 in the bank? Obviously, it’s always better to save money, whether it’s for college or retirement. Do so and you’ll enjoy more options. For parents who do have money to shelter from the federal aid formulas, 2012 did usher in some bad news. The amount of money that parents can protect has dropped. Last year, for instance, you could shelter $60,200, but the figure dropped to $53,400 this year. You can find the EFC Formula by Googling EFC Formula and 2012. You’ll find the right chart on page 19. When I have written about this before, some parents have believed that they subtract their asset protection allowance themselves before reporting their taxable assets on the FAFSA. Do not do this! The federal processing software automatically does this when determining what you EFC is. Have Questions for Duke’s Financial Aid Director? On Thursday at noon Eastern Time, Duke University’s director of financial aid will take viewer questions about paying for college. The conversation will include President Obama’s remarks in the State of the Union about student debt. Anyone can watch the webcast at no charge at http://ustream.tv/dukeuniversity. Questions can be emailed before or during the broadcast to live@duke.edu or tweeted with the tag #dukelive. I will be holding a college workshop at the University of California, San Diego this Saturday (Feb. 4). At the Finding the Right College Workshop, you will learn specific strategies to increase your child’s admission chances, ways to evaluate colleges and universities, essential ACT and SAT information and what you need to know about college rankings. Qualifying for Financial Aid: How Wealthy Is Too Wealthy? 4 Responses to Will Your Savings Hurt Your Financial Aid Chances? We are not finding this to be true at all. As two college financial advisors told us, if you have savings and it’s not retirement or a business account, the formulas consider it all fair game for being spent on college. So we have saved and saved and still can’t afford college for our kids while our acquaintances who said screw it, let the kids fend for themselves are getting substantial aid packages…. because they have no savings. Nice. I am afraid the financial advisors are painting a bleak picture unnecessarily. I suspect they want to sell you expensive insurance products to “hide” your assets. You parent assets are assessed at no more than 5.64%. So if you saved $100,000, you eligibility for aid would only be reduced by no more than $5,640. And there is a federal asset allowance so the aid penalty would be lower than that. It’s always a great idea to save for college. I have completed an undergraduate degree, worked for 3 years and saved money, am now a volunteer working overseas with 0 income (only a living stipend) and am applying for a masters degree. When I am applying for financial aid, how will my savings and retirement accounts be considered by the financial aid office? Will this money be considered available to pay tuition fees?